NASA's Mars Curiosity rover has landed in LEGO's toy catalog and is now available for order. The fifth in a line of fan-created, LEGO-produced building kits, the six-wheeled science laboratory could be followed by the now Pluto-bound New Horizons spacecraft, Hubble Space Telescope, or other space-themed kits, if the public votes for them online. The Curiosity rover kit came to be through LEGO CUUSOO, the company's social creation platform. "CUUSOO," which in Japanese means "imagination" or "wish," is a website that invites enthusiasts to share ideas for new LEGO products. Visitors to the site can vote for their favorite concepts and those that reach 10,000 supporters are then considered for production as an official LEGO kit. Among the previous LEGO CUUSOO releases has been one other space-related kit: a model of Japan's Hayabusa asteroid sample return probe that was sold in 2012. Among the most-backed ideas, and not just space-related but overall, is this moon landing mission set by CUUSOO user "suzuki," who was an early member to join the site. It includes the command module, lunar lander and the moon rover (the latter of "which was not used during [the] Apollo 11 mission," its creator correctly notes). "You're over half-way to the moon, er, to the review stage. Great work!" the CUUSOO team wrote when the Apollo 11 Lunar Mission model reached 5,000 votes. "This is a well-designed, focused concept that captures the essence of the Apollo 11 mission." Fan-designed LEGO spacecraft now up for vote on LEGO CUUSOO, including Apollo 11 Lunar Mission, Space Shuttle Crawler Transporter, Hubble Space Telescope, NASA Deep Space Habitat and New Horizons Spacecraft. As its project creator "Teazza" wrote, "this could open a new Architecture series based on space and aeronautical structures, like other facilities at NASA Kennedy [Space] Center and more." LEGO Architecture, introduced in 2008, aims to "celebrate the past, present, and future of architecture through the Lego Brick," and features such kits as New York's Empire State Building, the Seattle Space Needle and the Sydney Opera House. This CUUSOO idea extends the design and building themes to include the massive crawler transporter and mobile platform that carried NASA's space shuttle out to the launch pad. Perhaps perfectly timed for the Hubble Space Telescope's 25th anniversary in 2015, this model by CUUSOO member "GRusso" seeks to celebrate the accomplishments of the famous orbiting observatory. "For anyone who has gained inspiration or insight from the Hubble Telescope, this project would be a must have," the LEGO CUUSOO team wrote on Nov. 21, Edwin Hubble's birthday. "The design captures the telescope's beauty and mystery splendidly." "If you are wondering how I made it round," Grusso wrote, "well... let's say it took a lot of 'technic' parts and a lot of creativity. Can't really say more than that." Designed by user "Brianr8811," a former NASA intern who worked on the agency's Deep Space Habitat Project, this "space base" set replicates in miniature NASA's concept for laboratories, living spaces, and vehicles for astronauts on future missions to the asteroids, moon and Mars. "Who hasn't dreamed of traveling through space?" asked the CUUSOO team when the idea reached 1,000 votes in September. "With this project, LEGO Minifigures can live out those dreams. This project is the perfect combination of science and fun." The first of NASA's New Frontiers robotic missions, New Horizons will fly by Pluto and its moons in July 2015. The LEGO version of the planet(oid) probe is scaled to LEGO's 10-stud dish piece and has the wedge-shaped spacecraft's full suite of science instruments. Though it still has a long way to go until the 10,000 votes needed, this model created by "plutofan" has the backing of the actual mission's managers. "The real spacecraft ... is about the size and shape of a grand piano," New Horizons' mission team wrote. "But you might be able to own a smaller version, thanks to an effort to create a LEGO model of the spacecraft." 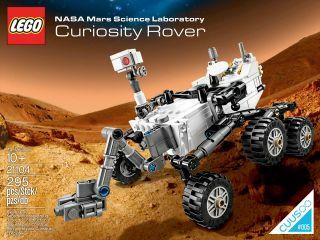 For more information or to order the Mars Curiosity Rover, see shop.lego.com. For more about any of the other sets in this story, follow the Vote links or see lego.cuusoo.com. Click through to collectSPACE for more photos of the LEGO Mars Curiosity Rover and the LEGO CUUSOO space sets.